When making sushi at home it is obviously best to be prepared. What this means is not just having the ingredients, but also knowing how they are used. I have prepared a simple checklist of items that you are going to need before you get underway with a few explanations for those of you who may be unfamiliar with some of the equipment or how to use it. Preparation really is half the battle. Pre-sushi preparation is key, and when you have your mise en place everything will be much simpler and remembering at the last moment about seasoning the rice, for example, is going to throw a serious monkey wrench into your sushi making plans. Some of these items are necessary. Some are required only for certain styles of sushi and some are entirely optional. There are many side items that some people like to munch on while eating sushi and I point these out because you may have seen them at the sushi bar but not know what they are or what they are called when you are looking for them at the store. And keep in mind that there can be many variations on the theme and what you may end up buying may not exactly match what you are served at a sushi restaurant. One thing to consider as a part of the preparation is what you will use to serve your sushi if you are not making it at the table a la carte. It is not hard these days to find authentic Japanese tableware and shoyu dishes, and if you choose to they make an already great meal even better. And usually more fun. For the most part, making sushi at home will be easier if you have access to a local Japanese market or store, and these days they are easier and easier to find. Many of these ingredients are becoming more popular and therefore more accessible in normal grocery stores as well, fortunately, so with any luck you will be able to find what you need somewhat easily. Making sushi at home will be much easier when you have everything you need ready when you need it, so avoid a scramble after you sit down by knowing what you need and having it at hand for making sushi. The first thing to keep in mind is your preference of seafood. Some people choose to use cooked ingredients, such as unagi (eel) or cured, such as smoked salmon, either because they are more comfortable with the cooked or treated foods, or to avoid any possibility of contamination. And always keep in mind your preferences as well as those with whom you will be dining. Raw seafood is best bought from a fishmonger or store where they understand that the fish is intended to be eaten raw. Some fishmongers have this high quality fish readily available, but if you are unsure, please ask. Japanese markets will often have sushi quality seafood for purchase. With the exception of one local fishmonger, I purchase all my fish from a Japanese market near me or online at Catalina Offshore Products. If you are looking for a whole fish keep a few things in mind. The eyes should be clear, not overly cloudy. It should not be slimy, the scales should not fall off easily, and the gills should be still red, not turning grey. The fish should also be redolent of the sea but not smell overly fishy. Personally, I do not buy whole fish when making sushi at home. I buy fillets or cuts that are already trimmed into a long rectangle, ready for slicing. These are readily available at many Japanese markets and online. No matter what, smell the fish (or its packaging). This will be the most telling activity as any fishy or off odors will immediately announce that the fish is not fresh. The nose knows, and this is a skill you will develop the more you make sushi at home. 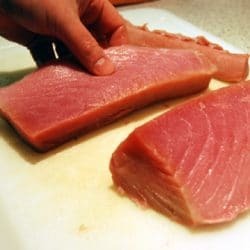 Some tuna (maguro) these days is treated with carbon monoxide to preserve its bright red color and while I don’t see the need, so far the US Food and Drug Administration seems to think this is safe. It does not effect the flavor, however, and most of the tuna served in restaurants is probably treated so it may be unavoidable. But ultimately buy what you like and enjoy yourself. Catalina has the best sushi grade fish and other seafood available, in my opinion. Check them out for almost everything you could ever want. Your food items. Whether fish, vegetables, or whatever may strike your fancy, you probably won’t overlook these, but the key is to have them prepared for inclusion in or on your sushi before you start construction. You don’t want to have to cut a fillet while making sushi, the pieces should already be sushi size when you sit down to make your sushi. But remember, safety first! Keep all raw seafood chilled and away from contaminants until you are ready to make your sushi. A sharp knife (a bento knife if you prefer). Cutting up all your ingredients is going to be more time consuming and difficult if you do not have a proper knife for the job. The Japanese have created a special knife for cutting fish called a bento knife which does the job very well. However there is no need to go out and buy one just for this task as any sharp knife will do. But definitely make sure that the knife is sharp as the sharper the knife the more clean and precise the cuts you will be able to make. A dull knife will crush your sushi maki and make things pretty messy. Bamboo mat (called a sushimaki sudare or maki su in brief). This is used for rolling and shaping cut rolls, called maki or maki-zushi and are necessary if making maki. They are truly invaluable as they ensure consistency in the final product and without one you would be hard pressed (ha ha! a pun!) to roll something as wide as a sheet of nori (seaweed) without a fiasco. Some cover their maki su with plastic wrap which can make pressing and releasing the roll easier (and can keep the mat cleaner when using the more moist ingredients), however I never found it necessary unless you are making ‘inside out’ rolls, with the rice on the outside. Sushi rice. Properly cooked and seasoned rice is critical to the process. Having your rice the right temperature is also very important. Japanese short-grain rice (also called ‘sushi rice’ in western markets) is the only rice that can be used for making sushi, it has the right amount of starch to keep it stuck together and ensure a proper final product. If you have a rice cooker, this should work well for you, however if not, see our ‘fail safe sushi rice’ recipe for instructions as to how to make rice for making sushi at home. Rice for sushi should be well aerated and room temperature, not warm or chilled. This way it will have the proper consistency as well as the stickiness required for sushi. It will also not interrupt the flavor of the sushi by adding a temperature element. Room temperature rice will ensure that you really taste the fish (or vegetables) in your sushi, and is the one thing I really feel the need to stress for those making sushi at home. Soy Sauce (shoyu). I don’t know anyone who doesn’t use shoyu when eating sushi, but I thought to include this as I remember a time when I assumed I had some in the larder but when I went to get it, there was none to be found. Put it on your checklist. Some people prefer lower salt shoyu, which is perfectly fine, but I would like to point out to everyone that there is a definitely difference in quality shoyu versus the plain old stuff. For many people this may be immaterial, and that’s fine, It’s all about personal preference, but I would suggest that anyone who has access to a decent Japanese market seek out some of the higher end shoyu and give it a try. There is an endless variety, and I have found some excellent shoyu just by being adventurous and asking the shop owners what they would recommend. Shoyu is like wine, and you get what you pay for. Some ‘artesianal’ shoyu that I have had the good luck of finding has had some truly spectacular qualities that make just sprinkling a bit on a bowl of rice a wonderful meal. Nori (seaweed sheets). These are usually only necessary if you are making maki (cut rolls) or sometimes as a garnish on a piece of nigiri sushi. However if you are making sushi at home with more moist or softer ingredients (tobiko or uni, for example) you will need a piece of nori to form a cup to hold the contents of these kinds of sushi. Nori is generally bought ‘toasted’ which means that it is properly dried for maki production, so there is no need to toss it in the toaster oven if you hear this word and think it is a necessary step. Often nori is cut into two or three strips to make maki rolling easier (as depending on how you make your maki, one sheet may be too large). Personally, I cut mine in half which I feel is the perfect size for making maki sushi at home. Wasabi (Japanese horseradish). While called Japanese horseradish in western circles, wasabi is actually not related to horseradish at all. It is its own rhizome and like nothing else on this earth (well, except it is knobby like any other rhizome). Some people like this spicy condiment on their sushi and some don’t. Again, it’s all about personal preference. But for those who do, wasabi is a great addition to sushi and can be easily found. When being purchased in the store, if you are lucky you can find an actual rhizome that you can grate yourself (with any grater, but for authentic Japanese style one would us a special grater made of sharkskin called an oroshi). But it is also available powdered and in tubes. More often, the ‘wasabi’ found is really American horseradish with coloring and flavoring, sometimes with a touch of real wasabi thrown in for the ‘wasabi’ claim. In the US, horseradish products such as these can be legally called ‘wasabi’ adding to the confusion. That said, most of the time you are given this product in a sushi restaurant and won’t get authentic wasabi unless you ask for it specifically, and often with a surcharge, so for the most part you can use the regular, easy to find product and will discern no difference. For home use, real wasabi can be found at Catalina Offshore Products. Ginger (gari). Pickled ginger is almost always placed on your plate as a tasty garnish when you order sushi. It’s great for clearing your palate between different types of sushi. Some people don’t like it, but for those who do, it’s cheap and easy to find. A note, traditionally, the better quality ginger is found in its original off-white color, not dyed pink. More recently, this is no longer the case and the ‘pink stuff’ has begin to catch on, but in my opinion it’s a marketing gimmick. While pink ginger can now be just as good (although not in every case), I always aim for the traditional non-colored to make sure I’m not getting something that was colored to hide its lower quality. Daikon (Japanese radish). The white, noodle like, and crunchy garnish that often accompanies sashimi (and sometimes sushi) is daikon and it not hard to find if you have access to a Japanese market. But you will have to grate it yourself. This is easy, and the otaku out there may even go so far as to buy a Japanese daikon grater to make the fancy strings that we are used to at a sushi restaurant. But if you do grate daikon for your meal keep it in water with literally a drop of rice wine vinegar or a touch of lemon juice if it will be a while before serving as the daikon will oxidize (turn brown) rather quickly. When you want it, remove it from the water, squeeze, and plate. Seaweed Salad. Crunchy, slightly sweet, and yummy, this is a nice start to the evening, if it’s your kind of thing. This is easily found at a Japanese market as well, but otherwise it may be hard to find and without finding the right ingredients (which you would find at a Japanese market) not easy to make. Some more upscale stores such as Whole Foods often carry this item. Sesame Seeds (goma). Sesame seeds are sometimes used as a garnish and sprinkled over a cut roll (maki) before cutting. They also add a bit of flavor to some items and can be used if you like them. Shiso. Shiso is the leaf of the perilla plant, a distant cousin of mint and basil. It is a rather large leaf with serrated edges and often comes in a pack of 10 or 20 if not picked from your backyard (and it takes over completely if you plant it, as I can attest). It is often used a garnish for sashimi but can also be incorporated into a roll, and I personally think it goes really well with california rolls, adding a savory quality that I would miss if I left it out. Miso paste/Miso Soup (fermented soybean paste). Miso soup is a great way to start the evening off and is amazingly easy to make. Miso paste is available in any Japanese store and while true miso soup is made with dashi (fish stock) one can easily find miso with the dashi already incorporated into the paste (specifically to be used for miso soup). If not, ask about a powdered base for dashi when you buy your miso paste. Heat as much water as you would like soup, and add any solid ingredients that you would like into the pot. I often put in some silken tofu (cut into 1/2 inch cubes), a few scallion or green onion slices, and some wakame (seaweed) after the water just begins to boil. When the solid ingredients have heated up (and the wakame softened as it is usually bought dried) which should only be a few moments, add approximately 1 Tablespoon of miso paste per cup of water and remove from the heat. The soup is ready to be put into bowls and enjoyed. Edamame (immature soybeans). This is another appetizer that is often found at sushi restaurants. The young soybeans are picked when they are still green and either boiled or steamed in their pods and served hot. Sprinkled with sea salt they make a great snack while you are getting yourself ready for your sushi making evening. High in protein and isoflavones, edamame are becoming the new health food as well, so enjoy your snack while you treat yourself to something that is readily acknowledged as one of the most healthful foods available. These days, they can be found in the frozen vegetable section at many grocery stores. Green tea. I drink green tea throughout my meal and it’s an easy way to impart authenticity into your experience. I’m assuming everyone knows how to make tea so there are no special instructions other than what you know. But I will point out that there is a special tea that I particularly enjoy called Tung Ting (or Dung Ding, which is close to how the tea is pronounced) which is actually from Taiwan, very slightly oxidized (and therefore technically considered an oolong tea and not a green tea) but probably the best ‘finishing’ tea I have ever found. It is incredibly floral, and tastes like a classic green tea, but is actually only produced in limited quantities and is therefore not inexpensive. But worth the purchase if you can find it (easy online). I got hooked on this particular tea after trying some in Taiwan at a teahouse in the mountains overlooking the sea. Sake. I love sake. Sushi without it is like a peanut butter sandwich without jelly. While traditionally sake is not drunk with sushi that’s not really something many people pay attention to anymore, not even in the very traditional sushi restaurants (I tell you from experience). So go for it. Find a brand that you like (I don’t want to name my favorites for fear of promoting any particular brand), which may take some time, but it will be a fun time I wager… More and more sake is becoming available at wine and liquor stores these days so finding something good shouldn’t be that hard. Keep in mind that many types of sake that are found in restaurants are not available through retail channels, which is something that can happen with regular wines as well. This is done to preserve the prices and availability of these brands. Suffice it to say that there are ways around this if it turns out your personal favorite is not readily available. Get to be friends with you local wine merchant and ask them about how to get the sake you want if they don’t have it already. You would be surprised how easily some ‘restaurant only’ sakes (or wines) can be acquired. Keep in mind that better quality sakes are served chilled, as white wine is, but if you prefer it hot you can find those as well. Chopsticks (Hashi). No Japanese meal would be complete without chopsticks. Unless, of course you hate using them. It’s your choice. For the most part, sushi is finger food, with the exception of sashimi and chirashi, so having chopsticks certainly adds authenticity, but especially at home, is far from necessary. While there are many items that I could include, those are the standards, but feel free to use your imagination. With just a few ingredients you can make a pretty tasty sushi dinner, so just make sure that you are prepared when the time comes and keep this checklist at hand if you need it. Making sushi at home is not hard, but until you are practiced it can be a time consuming venture. Try to relax and enjoy yourself while getting everything ready and you should have a great time.